When it comes to picking the best Dell laptop for 2019 you've certainly got plenty of choice – Dell has a huge and varied range of computers to pick from. That wide choice can make comparing models tricky, but we're here to help you make sense of what Dell has on offer. Whether you want the best Dell laptop for work, or the best Dell laptop for school, or the best Dell laptop for anything else, you'll find the answers you need here. We've looked at the specs, the designs and the prices to bring you the most comprehensive guide possible. We should point out that the Dell range is tweaked all the time in terms of specs and model availability, so head direct to Dell to see the latest configurations and prices. The details listed here were correct at the time of writing as per the official Dell UK website. The process of choosing the best Dell laptop is the same as it is for any laptop: decide where your own particular sweet spot is in terms of price and power, and pick accordingly. The more you pay, the faster your laptop will run, and the longer it should last you. There's another balance to strike though, which is power vs portability. Not only are more powerful laptops more expensive, they're more difficult to lug around – if you want the very best laptop components, you'll need a bigger laptop to be able to fit them all in. The Dell badge gives you a certain guarantee in terms of quality, so whichever laptop you opt for it's going to serve you well – you just need to decide the sort of specs you need, the price you can afford, and the amount of effort you want to put into carrying it around. The Dell XPS 13 is the very best laptop that Dell has to offer right now, recently tweaked at CES 2019 to put the webcam up at the top... where it should be. All the power you could ever want, in a stylish and compact chassis, in a size that's easy to carry around with you. Of course if you value screen size over portability then the XPS 15 is another very appealing device you can take a look at, but we think for most people the Dell XPS 13 is the best Dell laptop money can buy. It looks the part and is going to last you for many years to come. There's also a Dell XPS 13 2-in-1 model, if you want a laptop that can double as a tablet. As noted above, the Dell XPS 15 is essentially the XPS 13 with more screen space for your Netflix movies or your Excel spreadsheets. 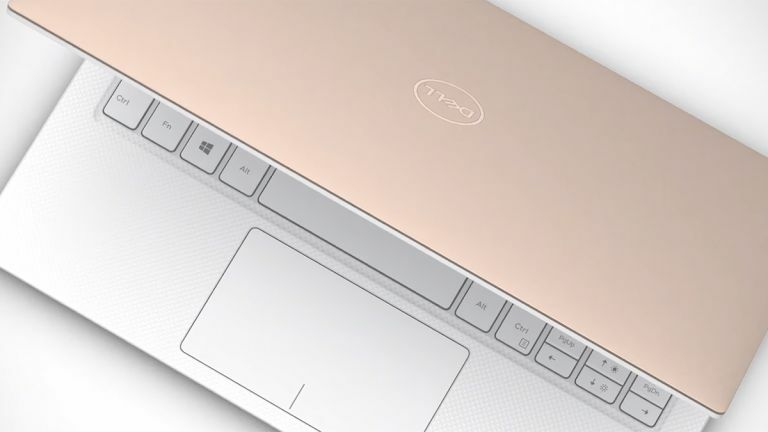 That larger size means room for more powerful components too – the XPS 15 goes all the way up to the latest Intel Core i9 processors. There are configurations with more RAM than the XPS 13 can offer, as well as room for discrete graphics from Nvidia. If money is no object, you want more screen size, and you don't mind a little less portability, then pick this Dell laptop instead of the XPS 13. There's also a Dell XPS 15 2-in-1 model available, if you need a more flexible form factor. The absolutely mammoth Dell G3 is the best Dell laptop to get if you need some extra gaming power and aren't planning to carry your computer around very often. It's packed with top-end specs, but that 17.3-inch screen is the real star of this particular show. The resolution maxes out at 1080p – perhaps to keep the G3 separate from Dell's Alienware line and to eke out a bit more battery life – but when it comes to discrete graphics, the Dell G3 can't be beaten. Definitely one that's going to appeal to gamers who are on a budget. If the Dell G3 gaming laptop isn't for you, what about the Dell G5 gaming laptop? What are the differences, you ask? Well, it's a little cheaper, a little less expensive, and a little smaller – suitable for gamers who actually want to be able to carry their laptops around with them. It's another laptop to consider if you're serious about gaming (note that discrete Nvidia graphics chip and the i7 processor) but don't want to splurge all the way to an Alienware laptop. The Dell G5 is also a bit more boxy than the Dell G3, which you may or may not like. Picking an Inspiron laptop is all about balancing how much you want to spend and how powerful you'd like your laptop to be. Spend the most possible – on an Inspiron 7000 Series – and you get the better machine, but that's not always the best deal for everyone. We'd say the Inspiron 7000 Series is the best Dell laptop for those who want a solid option at a decent price. 13-inch and 15-inch models are available, so take your pick: you can get some really good specs, with a few small shortcuts (there's no 4K display option here). There's also a Dell Inspiron 7000 Series 2-in-1 model available, to further increase your options. A little further down the price/performance ladder is the Inspiron 5000 Series, giving you a whole host of buying options – 13-inch, 15-inch or 17-inch screens for a start, plus a wide choice of specs, from the processor to the RAM to the sort of graphics you want inside. As a result it's the best Dell laptop for a lot of people, and particularly those who want to keep costs down and don't necessarily need the very best Intel processors or the most RAM. While other Dell laptops are prettier, few can beat the Inspiron 5000 Series for value. We'd only recommend the Dell Inspiron 3000 Series if you're really trying to keep costs down – but if you fit that description then this might well be the best Dell laptop for your needs. To get the lowest price possible, go with Linux on board instead of Windows. These laptops are hardly lookers, and won't run the most demanding games or programs for you, but the price is very hard to argue with. You can still spec the Inspiron 3000 Series up enough that it'll cope well with most of the everyday tasks you throw at it.